Like regifted fruitcake and grown men in Cosby sweaters, eggnog is one of those enduring holiday traditions you just can’t avoid this time of year. Some relentlessly festive people even claim to like it. “How bad can raw eggs, whole milk, refined sugar, heavy cream, and—unless you have the time to make it from scratch—assorted additives and preservatives like guar gum and carrageenan be?” they tell you. To find out, we tested several store-bought brands, and were stunned to discover one or two we actually liked. Then we asked Waterfront Ale House’s Sam Barbieri, an old eggnog master who sells his own high-octane version by the $5 glass and $22 takeout liter every winter, to share his excellent recipe so you can properly doctor your own nog at home. Organic Valley, $3.69 per quart at Whole Foods. Superthick and rich, this nog, made from mostly organic ingredients, took top honors for a relatively mild sweetness, a nice creamy color, specks of vanilla bean, and a pleasing “melted ice cream” consistency. Southern Comfort, $3.29 per quart at Gristedes. A dark-horse favorite that came in a black carton (very Johnny Cash), and surprised the panel with a good balance between sweet and spice, despite an eerie yellow tinge. 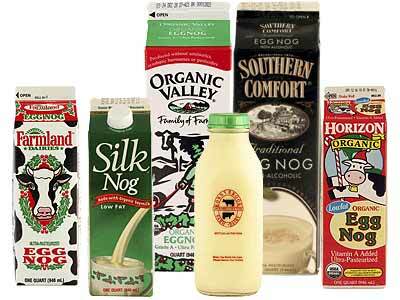 The eggnog of choice for Janis Joplin fans. Axelrod, $2.99 per quart at Gristedes. “If you spike it with a lot of booze, I could probably handle half a cup” was the comment that said it best. Although it had a decent fresh-milk quality about it, it was overwhelmingly sweet. Horizon, $3.69 at Whole Foods. Way too sweet, with a throat-scorching bite; some guessed that it was a soy-milk version. Ronnybrook, $5.25 a quart at Ronnybrook at Chelsea Market. The big shocker: This old-fashioned dairy farm produces delicious cream-on-top milk, but leaves a lot to be desired in the eggnog department. It had a very harsh, supersweet, and chemically taste. “Ewww,” “yecch,” and “agghh” summed it up. 1. Blend all ingredients (except nutmeg) well. 2. Garnish each glass with fresh grated nutmeg.